You’re doing everything right. You’re training 3-5 times per week, eating balanced meals, Sleeping well. Yet, there’s a problem: you’re not losing body fat. Does this sound familiar? Whenever we welcome a new client to Integra, we review their nutritional habits. Do they have protein at every meal? Are they drinking enough water daily? And so on. In other words, we apply best practice nutrition principles to identify weaknesses in their diet. But this isn’t always enough, as I discovered for myself. I’d been trying to improve my body composition (fat to muscle ratio), but my progress had slowed. Somewhat perplexed, I started paying closer attention to my diet: tracking everything I ate and drank over the course of a week. Then, it became apparent: hidden calories! Although I’d followed the same advice I give to my clients about developing healthy food habits, I hadn’t paid enough attention to the little extras: the splash of milk in my coffee, the mid-morning cashew snack, and the glass of wine with dinner. This seemed reasonable – after all, I believe in balance – but the calories were adding up. Two lattes, a handful of cashews, and a chocolate bar make a whopping 966 calories. If you’re aiming for 1800 calories per day, that’s 50% of your target gone in ‘extras’ alone. When we work with clients, we focus on particular aspects of nutrition at each phase of their exercise program. Once they’ve established a baseline for healthy eating habits, we refine things even further. We ask them to track every morsel of food and every sip of liquid consumed over a set period. Yes, it’s an involved task, but the results speak for themselves. It’s surprising how quickly the memory forgets a square of chocolate here or a beer there. But, with a food diary, there’s nowhere to hide. Latte – A medium (grande) latte from Starbucks is 220 calories. 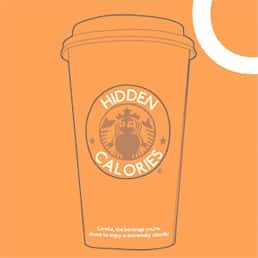 A regular caffeine fix on your way to work clocks up 4400 calories (220 x 20) each month. Assuming a daily target of 1800 kcal, that’s the equivalent of an additional 2.5 days of food per month! Wine – I wish wine calories didn’t count, but this macronutrient holds 7 kcal/gr. A large glass of red wine (175 ml of Montepulciano D’Abruzzo) has roughly 123 calories. So, if you have just one glass of red wine with dinner for five nights a week, that’s an extra 2460 calories per month. The Integra method focuses on balance and sustainability. We believe in enjoying life, so we aren’t suggesting ditching the lattes or wine altogether. However, if you have specific targets for fat loss and you aren’t achieving the results you want, eliminating hidden calorie hotspots is a quick win. What can you do to monitor your calorie intake? Research suggests that by keeping a food diary, you’ll improve your chance of losing weight by 100%! Track everything you consume for three days, and you’ll have enough data to establish your typical daily intake. For best results, include a weekday and the weekend. Why not try it out and let us know what you find? Share your discoveries with us on Twitter!